Those who advocate for greater investment in education often make the economic argument: more education leads to higher wages and is critical for financial stability and independence. They’re right. Robust evidence supports the view that higher levels of educational attainment are linked to higher incomes, less unemployment, less poverty, and less reliance on public assistance. or who enter and graduate college, but it is also good for all of us, paying big dividends in the form of increased civic engagement, greater neighborhood safety, and a healthy, vibrant democracy. This report is a companion piece to the online Common Good Forecaster,™ a joint product of United Way and Measure of America. It takes a closer look at the ten indicators featured on the Forecaster and makes the case for why education matters to each of these critical areas. What's the value of education? See how differing educational attainment levels affect communities across a whole range of indicators. 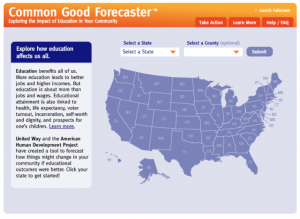 Launch the Common Good Forecaster™!